(The Bay area premiere of “The Whipping Man”, co-produced by the Marin Theatre Company and the Virginia Stage Company, plays at the Boyer Theatre from March 28 through April 28). The moment we see Kat Conley’s remarkable set design of a crumbling antebellum southern plantation house and hear the haunting sounds of a stormy night as beautifully realized by sound designer Will McCandless, Matthew Lopez’s “Whipping Man” carries us away into a fantastic Southern gothic world rich with poetic imagery and slippery realities. Tobie Windham as John, L. Peter Callendar as Simon and Nicholas Pelczar as Caleb in “The Whipping Man”. Photo credit: Marin Theatre Company. The crumbling facade appears about to collapse. We see only by candlelight (completely convincing with Ben Wilhelm’s excellent lighting design). A masked man lopes mysteriously past the broken windows of the front hallway. Then a desperately wounded soldier stumbles in and collapses. This is among the most dramatic openings you are likely to see in the theatre, and it works well. The audience is rendered breathless in short order. The act that follows is mostly exposition. We learn that the house is the home of the confederate soldier Caleb (Nicholas Pelczar) and that it has been cared for by two slaves of the family who are now free but remain because they have no place to go and are hopeful that the master of the house will return and give them some promised money to make their way north to a new life. After the initial exposition, the plot of this play is remarkably convoluted, perhaps too much so, but it provides many extraordinary opportunities for a trio of highly skilled actors, particularly L. Peter Callender as the elderly, recently emancipated slave, Simon. Callender is called upon to play scene after scene of extreme emotional intensity and he rises to it over and over again in a performance of operatic grandeur. It is a career highlight performance for this always excellent Bay area actor. Among the most interesting discoveries in the play is the Jewish identity of the three men. Caleb’s father, the plantation owner, is Jewish and he saw that the slaves raised on his plantation were given a Jewish religious education as well. The peculiarities of this situation bring many opportunities for reflection on the meaning of slavery and freedom. How can a Jew, whose primary religious celebration emphasizes the release of the Jewish people from slavery, hold slaves? What can the celebration of a Passover Seder possibly mean to Black slaves in the antebellum American south? When Callender’s Simon insists upon holding a Seder in the midst of disaster, singing “We are coming Father Abraham”, and reporting how he has learned of Lincoln’s assassination or when he reflects upon the nature of freedom and Jewish identity, the stormy emotional currents set loose upon the stage powerfully reflect the stormy circumstances of the story. This is a play about unending torment: emotional, physical, religious, social, familial, all at the hands of the mysterious figure of the ‘whipping man’ vividly described by the older and younger former slaves, Simon and John (the latter played well by a very charismatic Tobie Windham). One wonders if perhaps this whipping man might not be G-d Himself. It is a deep play. Perhaps too deep for easy comprehension. One is left with the feeling that the ever more complex details and secrets revealed in the course of two acts are too much to follow. Playwright Lopez makes unusual demands upon his audience, perhaps a bit more than necessary. Director Jason Minadakis, however, does an excellent job of keeping the play emotionally interesting through every sequence, even in the midst of an over abundance of detail and revelation. The design elements are uniformly excellent, and, most importantly, the actors take the audience on a memorable emotional ride, not easily dismissed, and likely to remain in the heart long after seeing the play. 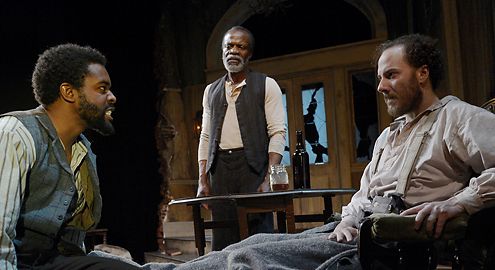 “The Whipping Man” by Mathew Lopez, co-produced by the Marin Theatre Company and the Virginia Stage Company. Director: Jason Minadakis. Scenic Designer: Kat Conley. Lighting Designer: Ben Wilhelm. Costume Designer: Jacqueline Firkins. Composer: Chris Houston. Sound Designer: Will McCandless. Caleb: Nicholas Pelczar. Simon: L. Peter Callender. John: Tobie Windham. Posted in Reviews.Tagged Ben Wilhelm, Chris Houston, Jacqueline Firkins, Jason Minadakis, Kat Conley, L. Peter Callender, Marin Theatre Company, Matthew Lopez, Nicholas Pelczar, San Francisco Theatre Reviews, The Whipping Man, theatrestorm, Tobie Windham, Virginia Stage Company, Will McCandless.